AgroAtlas - Relatives - Festuca rubra L. - Red fescue. Family Poaceae Benth. Genera Festuca L.. Long-term cereal. A plant with creeping, more or less long rhizomes that does not form turf; stalks of height of 30-80 cm, covered with red-brown vaginas as the base. 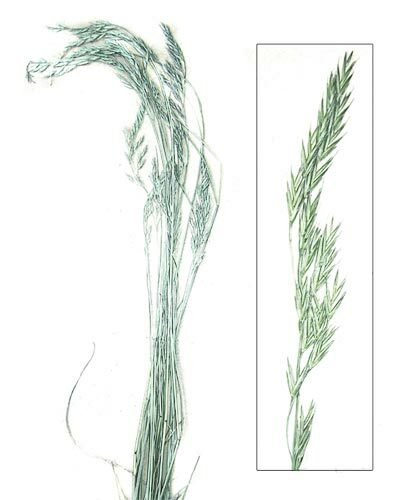 Leaves of vegetative stalks are 0.6-1.2 mm long; leaves of generative stalks are 2-2.5 mm wide, flat; vaginas closed for almost their entire length, the top edge having 1-2 unequal, rounded lobes; ligula bare, short. Panicle compressed, 5-10 cm in length. Spikelets 7-10 mm in length with 4-6 flowers and a wax bloom. The bottom floral scales are 4-6 mm long, bare or with short pubescence, with awn 1-4 mm in length. Blossoms in June-August. Anemophilous. 2n=42, 56. Occurs throughout the European part of the former USSR, Siberia, the Far East, the Caucasus, Central Asia, Europe, Northern Africa, Asia, and North America. Mesophyte. Grows in woods, on dry lands, in inundated meadows, and in bogs. Cereals of Ukraine. 1977. Kiev, Nuakova Dumka, 518 pages. Grossheim A.A. 1939. Flora of Caucasus. Vol. 2. Polypodiaceae - Gramineae. Baku, Publishing house AzFaN, 587 pages. Kharkevich S.S., ed. 1985. Vascular plants of the Soviet Far East. Vol. 1. The Science, 398 pages. Malyshev L.I., Peshkova G.A., eds. 1990. Flora of Siberia. Vol. 2. Poaceae (Gramineae.) Novosibirsk: Science, 361 pages. Malyshev L.I., Peshkova G.A., eds. 1979. Flora of Central Siberia. Vol. 1. Onocleaceae-Saxifragaceae. Novosibirsk: Science, 431 pages. Tzvelev N.I., ed. 1974. Flora of Northeast of the European part of the USSR. Vol. 1. Families Polypodiaceae - Gramineae. Leningrad: Science, 275 pages. Tzvelev N.N. 1976. Cereals of the USSR. Leningrad, Science, 788 pages.